In 1962, he installed a 3-wire, 120/240V fast-acting circuit breaker, with a 100A overload/short-circuit trip capacity, and ground trip capacity of 18mA in his home to provide it with whole-house ground-fault circuit protection.4 This device was later commercialized, and became the forerunner to the ground-fault circuit interrupters (GFCIs) that today are a ubiquitous part of the electrical infrastructure in homes and businesses. Since its invention nearly 60 years ago, the GFCI has undergone numerous design iterations and technological advances that have enhanced its personnel protection features. Many of these improvements have been at the urging of the Consumer Products Safety Commission (CPSC), an independent agency of the U.S. Government. 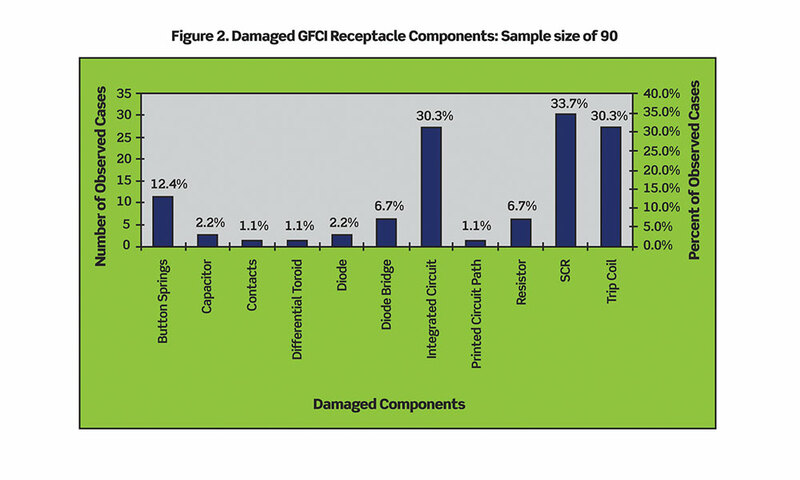 In concert with Underwriters Laboratories (UL), the National Electrical Manufacturers Associations (NEMA), and other professional groups, the CPSC has encouraged continuous design improvements to make GFCIs as failsafe as possible. In one of the very first speeches given by former CPSC Chairperson Ann Brown at a National Electrical Safety Foundation (NESF) reception, she said, “I asked NEMA to make GFCIs better. I wanted consumers to be able to check to see if a GFCI was installed and working correctly.” As the number of installed GFCIs has increased substantially since Chairperson Brown addressed the reception attendees on June 8, 1999, so too has the need for greater reliability of GFCI personnel protection devices. In recognition of that need, UL has required GFCI manufacturers to comply with an increasing number of safety enhancements to maintain UL Listing. Over the past two decades, these improvements have called for increased voltage surge immunity, safeguards against line/load wiring errors, and most recently, an auto-monitoring/self-test function. Unfortunately, even if end-users regularly tested their devices, a device that did not test properly could nevertheless be reset, and continue to provide power, without providing ground-fault protection. Without a built-in power denial feature, a consumer could assume that if power is available, so is protection. Many were (and continue to remain) unaware of the need for regular testing, despite manufacturers’ warnings; and others, who were aware, were not always conscientious in performing the testing. Further, resetting a tripped GFCI, without re-testing it left many consumers with unprotected power based on the particular model that was installed. These findings prompted a NEMA-commissioned study (The GFCI Field Test Survey Report) in January 2001, which despite a significantly smaller sample size, essentially corroborated the findings of ASHI home inspectors two years earlier. NEMA’s study additionally went a step further. It examined the damaged parts in both inoperable GFCI circuit breakers and GFCI receptacles. The findings are shown below in figures 1 and 2. 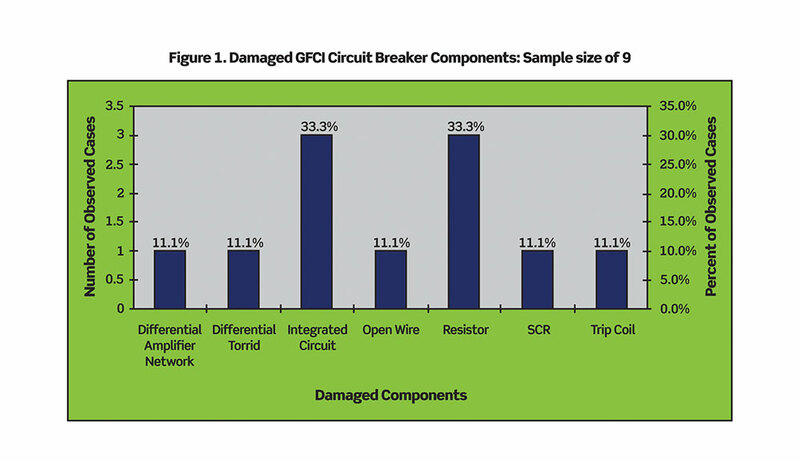 What these findings demonstrated across both GFCI form factors was that the integrated circuit, SCR, and trip coil were among the most common single components to fail, and cause the devices to cease providing ground-fault protection while continuing to provide power. The findings of this study (and the earlier 1999 study) prompted the design of a reset/lockout style GFCI that prevented resetting of the device when GFCI protection was lost as the result of either a trip coil or SCR burnout. While this device was a major step forward in raising the bar for end-user safety, reset/lockout functionality with power denial has yet to become a UL certification requirement for all GFCI manufacturers. Based on the extremely high percentage of comprised GFCIs in high lightning-strike areas of the country, UL did, however, require a more robust voltage surge immunity test (and other new requirements) for devices manufactured as of January 1, 2003. Subsequent revisions to the Standard, such as the 2006 requirement that prevented power from being connected to the receptacle face and all downstream receptacles, when the device’s diagnostics and test sequence detected a line/load wiring error, also improved consumer safety by raising the bar again. However, the power denial requirement was only applied to line/load reversal errors during installation and reinstallation. Most recently, in recognition of the fact that consumers do not regularly test their installed GFCIs, UL and NEMA called for an auto-monitoring/self-testing feature in its latest revision. Effective June 29, 2015, the revision requires periodic automatic monitoring/self-testing of the GFCI’s ability to respond to a ground fault. According to the Standard, if the device detects a problem during auto-testing, the GFCI must either deny power to the outlet or provide a visual and/or audible indication. In effect, manufacturers are able to implement a higher level of consumer safety or a reduced level of safety that can place some consumers at risk without their knowledge, based on the particular type of device they have installed. However, the CPSC was unsuccessful in persuading UL to adopt or advocate for this measure uniformly. The standard does, in fact, include a provision that power may be denied to the outlet, but similar to the 2006 requirement, this is only in the instance of line/load wiring errors during receptacle installations, not when GFCI protection is lost, and the device has reached its end-of-life. In this case, there are exceptions and alternative ways to meet the standards. There are many root causes behind a GFCI‘s inability to continue providing ground-fault protection. These are either linked to a single component failure or multiple component failures. As shown in figures 1 and 2 (reproduced from the early-cited NEMA study), a common cause of failure for both receptacle and circuit breaker GFCIs is an SCR or a solenoid failure. UL-943 states that a GFCI receptacle must check (self-test) its SCR and solenoid, in addition to other components, and respond if the component(s) have been damaged. Circuit breaker GFCIs are, however, exempted from part of these requirements. As shown in the illustration that follows, Section 6.20.2 of the Standard provides specific failure modes that signal an end-of-life event for both GFCI receptacles and GFCI circuit breakers. 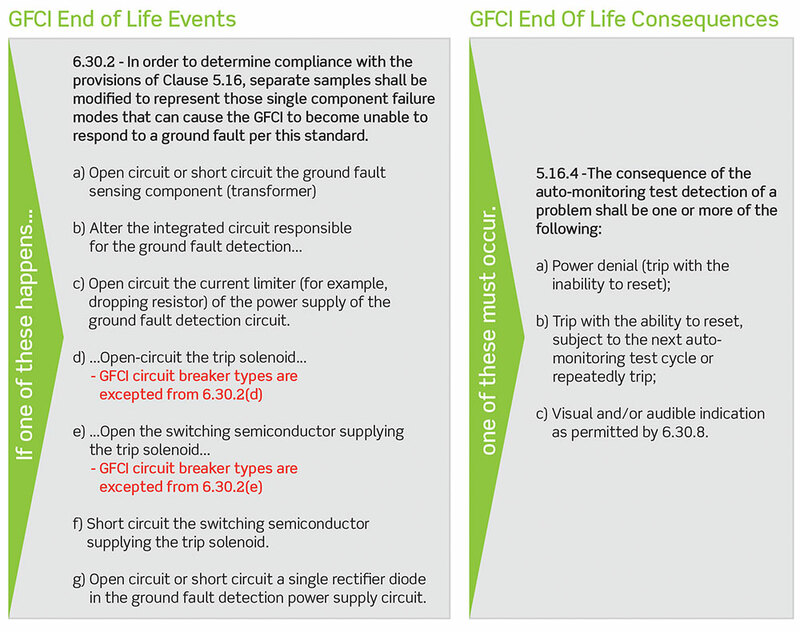 If any of the seven end-of-life events described above occur, GFCI protection is lost. While GFCI receptacles are required to respond to all seven end-of-life events, GFCI circuit breakers are only required to respond to five of the seven. The exemptions apply to both GFCIs and dual-function AFCI/GFCIs and permit GFCI circuit breakers to potentially provide unprotected power even after an end-of-life event has compromised the protection. Most alarming, if either the SCR or solenoid fails in a GFCI circuit breaker, the end-user may still be able to reset the breaker, and unknowingly be unprotected from ground fault shock or electrocution. The manner in which individual manufacturers choose to apply the current UL-943 end-of-life provisions to the design of their products, means that some will sell products that deny power, with end-users having no ability to reset the device; some will sell products that provide a visual or audible indication of end-of-life, and still provide unprotected power; and some will sell devices that trip, with a reset capability subject to the next test cycle or repeated tripping. In addition to the discretionary design choices it permits manufacturers, the Standard also permits circuit breaker manufacturers to be exempted from two of seven end-of-life component tests, allowing these devices to meet a lower safety standard than is required by the Standard for GFCI receptacles. It’s important to note that while these exemptions were an accommodation to circuit breaker manufacturers based on the way in which their devices are designed (i.e., the electronics are integrated within the load side of the device, rather than the line side, and the device isn’t always powered after tripping), the compromise allowed the auto-monitoring requirement to be added to the Standard. Fortunately, circuit breaker technology has since evolved so that the additional two test requirements can be satisfied without the necessity for the two exceptions that are currently permitted. Recently, GFCI circuit breakers have been presented to UL and received its Listing, without reliance on the two exceptions. This raises the bar for safety once again and makes it time for UL to consider upgrading its Standard once more. Charles F. Dalziel, Electric shock hazard, IEEE Spectrum, February 1972, p.41. S. Campolo, Are all those GFCIs out there Working? The ASHI Reporter, July/August 2000, p.15. a) U.S. Consumer Product Safety Commission, “Request for Comments on Ground Fault Circuit Interrupters to John Kontz, Underwriters Laboratories from Douglas Lee,” September 21, 1999, Washington DC; b) U.S. Consumer Product Safety Commission, “Letter to James Beyreis, Underwriters Laboratories, from Ronald L. Medford,” November 28, 2000, Washington DC; c) U.S. Consumer Product Safety Commission. “Engineering Staff Position Paper on GFCIs: Major Upgrades to the Standards are Needed,” April 20, 2001, Washington DC. Steve Campolo serves as Vice President, Codes, Standards and Certifications for Leviton. Campolo has over 40 years of industrial experience in product development, safety engineering, and engineering management, and holds over 33 US patents. He is Chairman of the NEMA 5PP Section for Personnel Protection Products, as well as past Technical Committee Chair of 7XC Flexible Cords, and 5PP GFCI’s. Campolo is the primary member of NEC code panel 2, and an alternate on panel 18. He is a primary member of NFPA 921 & 1033 committees for Fire Investigations. In addition to engineering management, Campolo also serves as an expert witness providing scientific testimony. He sits on several UL Standards Technical Panels (STP’s), including GFCIs, Switches, Receptacles, Plastics and others. Campolo is a member of UL’s Advisory Council for Follow-Up Services and contributes to electrical industry publications, including IAEI NEWS. He holds a Bachelors from New York Institute of Technology and Masters from Long Island University.